BMW's 3-Series cars offer a truly satisfying driving experience. The 3-Series lineup is composed of sedans, coupes, convertibles, and wagons. They vary in price, power, and packaging, but all are superb cars. The 2002 BMW 3-Series Sedan is powered by a base 2.5-liter Inline-6 with 184 hp. Also available is a 3.0-liter Inline-6 with 225 hp. The 2002 BMW 3-Series Wagon is powered by a 2.5-liter Inline-6 with 184 hp. 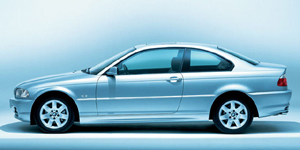 The 2002 BMW 3-Series Coupe is powered by a base 2.5-liter Inline-6 with 184 hp. Also available is a 3.0-liter Inline-6 with 225 hp. The 2002 BMW 3-Series Convertible is powered by a base 2.5-liter Inline-6 with 184 hp. Also available is a 3.0-liter Inline-6 with 225 hp.